Are you addicted to vitamin sea? Do active volcanoes make your heart race? What about chasing unimaginably blue waterfalls? Bordering Nicaragua and the Pacific Ocean, Costa Rica’s northwestern province of Guanacaste is a nature lover’s paradise. The golden coast is made up of mountains, national parks, endless beaches, exotic wildlife and magnificent waterfalls you have to see to believe. Of all the things to do and see, my top activity in Guanacaste was the Rio Celeste waterfall hike. The waterfall is located within the cloud forests of Tenorio National Park and is known for its hypnotic blue color and tropical surroundings. 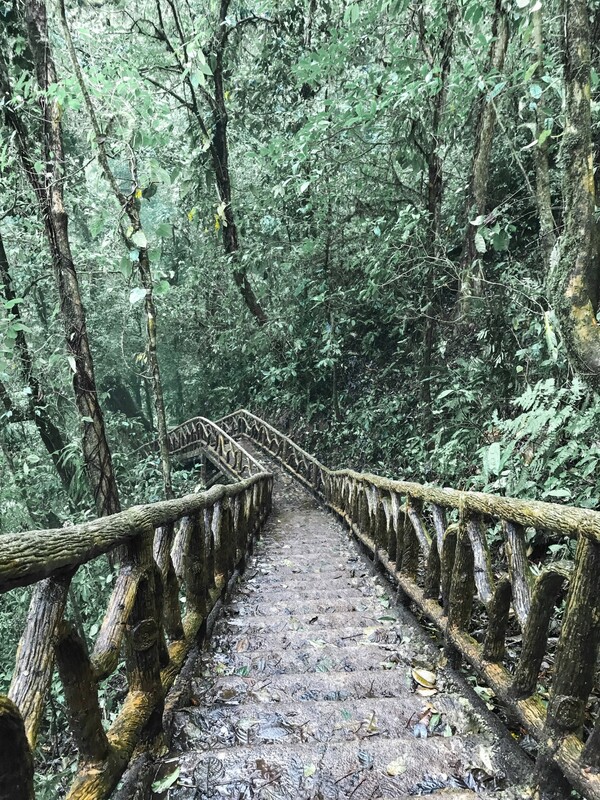 This is exactly how I felt as I made my way down the stairway to the Rio Celeste Waterfall. From the beginning of the hiking trail, it only takes about 30 minutes to get to the falls. As you go down the 180 meters of steps, the sound of the waterfall becomes louder and more powerful. There’s a viewing platform at the bottom where you can admire Mother Nature’s handiwork and, of course, take ample photographs. Naturally, the hike gets busy during the day so I recommend going early in the morning to avoid the crowds. The park opens at 8am and closes at 4pm. Furthermore, you must enter the park before 2pm. 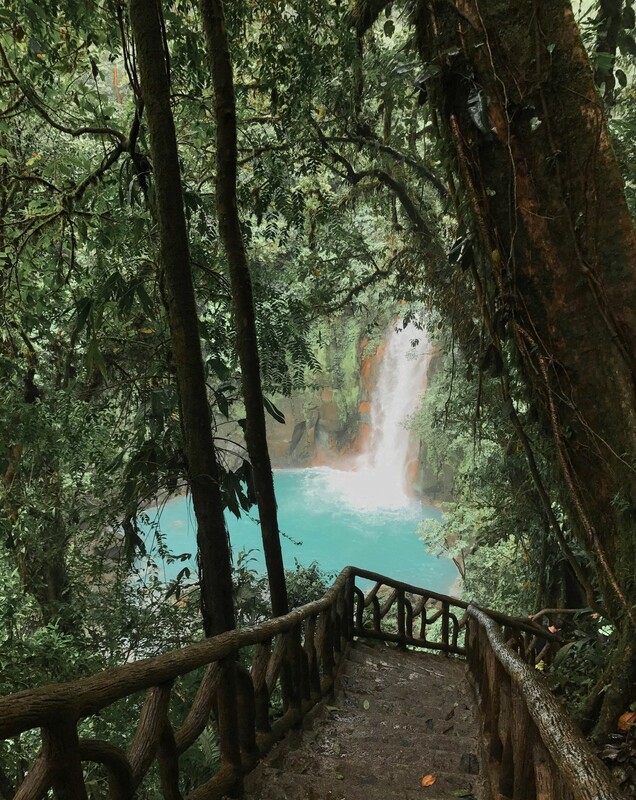 If you’re wondering how the Rio Celeste got its show-stopping blue color, just ask the locals! They’ll tell you God dipped his brush into the river as he was painting the sky. Although, according to science, the water gets its turquoise blue hue from a chemical reaction between volcanic and rainforest minerals. Nevertheless, this activity in Guanacaste is well worth the leg work. At the time of my visit, the entrance into the park was $12 USD for adults and $5 for children. 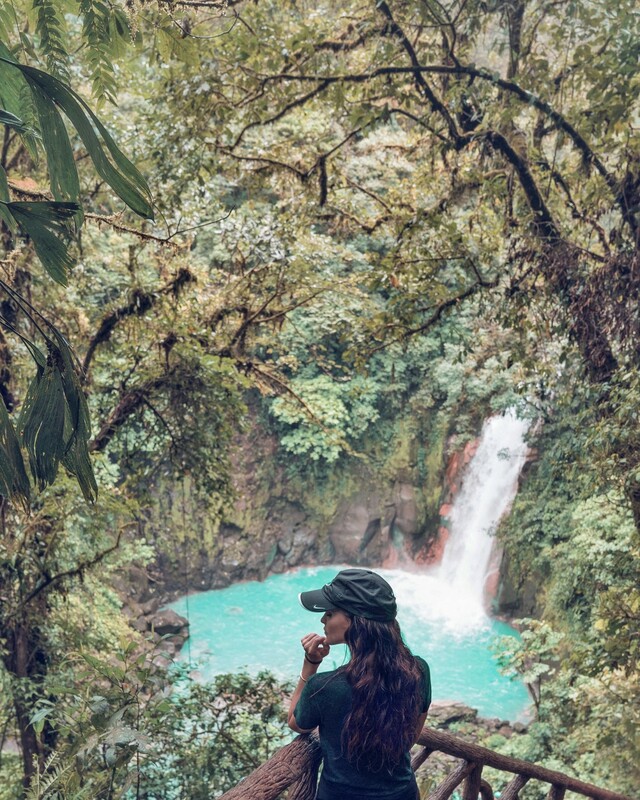 How long is the Rio Celeste waterfall hike? The entire trail there and back is 4.5 miles long and takes about 3-4 hours to complete. With that being said, it is possible to hike the waterfall portion only in under 45 minutes. This is a good option if you are short on time or question your fitness level! Continuing past the Rio Celeste Waterfall will take you to several natural points of interests. The most popular being a lookout point over the lush rainforest, the blue lagoon, a glimpse of bubbling hot springs and the point where the two rivers merge forming the bluest part of the river. Can you swim in the Rio Celeste? Unfortunately, swimming is strictly prohibited inside the park. I wouldn’t let this stop you from visiting, because the sheer beauty on land is something plucked out of a jungle book fairytale. Hiking shoes – The trails can get very muddy, thus a good pair of hiking shoes is a must. Raincoat – After all, this is the rainforest we are talking about. It rains quite often despite a sunny weather report. Protective camera gear – Make sure to use protective covering to safeguard your camera equipment from getting wet. Water – Certainly bring a bottle of water (or two) if you plan to do the entire length of the hike. When is the best time to visit Rio Celeste? The best time of year to visit weather-wise is during the dry season between December and April. However, as with any popular attraction during the high tourist season, there will be crowds. I suggest going as soon as the park opens to avoid the rush of traffic. Will I see any wildlife on the trail? The national park is home to an abundance of wildlife. We saw exotic birds, howler monkeys, dart frogs and coati all around us. Wondering where to stay in Guanacaste, Costa Rica? Read about my experience at the Four Seasons Resort on Peninsula Papagayo. My tour was set up by Costa Rica Star Villas. Our driver, Blair, was amazing and came on the hike with us as our guide.